Driver Moreton Wilson RASC (known as ‘Joe’) from Workington, Cumberland. 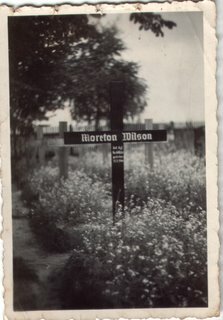 Moreton sent this photograph back home to his family while in captivity. On the back, he wrote : “I send you this on my birthday”. The temporary wartime resting place of Driver Moreton Wilson RASC in St Michael’s Church, Hindenburg in what is now Poland. Most family and friends knew Moreton as ‘Joe’. Moreton was married to Violet and they had four children: two boys and two girls. The family home was in Workington, Cumberland (now Cumbria). Did anyone ever have the enduring delight of Dehydrated meat ? to regain it’s initial bulk. These procedures were quite naturally, subject to the Official secrets act of 1938 sect 5 – para 6 – line 9. So we were completely in innocence of the effects of these procedures at any stage of the development. 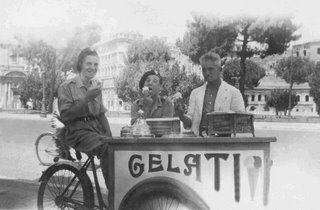 The day duly arrived when we were served – it must be said – lavish proportions of this new development in the progress of man, to which all and sundry enjoyed, or at least the enjoyment was apparent inasmuch as the Orderly Officer heard NO complaints. It should be noted that the Orderly Officer that day was the strapping 6’4” – 250 pound, South Africa International Rugby player, Captain Christopher Newton – Thompson M.C. It should also be noted that the Latrine was a gold standard version of those things which had been hand made and sandpapered by a journeyman joiner, who doubled as tank gunner for the writers crew. It was later in the early evening when the aforesaid Dehydrated meat had a most unusual effect . Our gold standard latrine was in overdrive for some time with some victims not making it all the way, and the evidence was masked by the onset of sudden darkness which happens in the lea of the Atlas Mountains. The senior Non Commissioned Officers of our squadron invariably ate their dinners as only gentlemen should, later than the other ranks and therefore were somewhat in ignorance of the trials and tribulations which had befallen the rankers earlier and so when they felt the necessary urge to visit the latrine – the overstrained main beam broke with a mighty crack and allowed the Squadron Sergeant Major – the Squadron QMS – the Squadron Sergeant Cook and the REME Sergeant Fitter to land in the mire, shall we say. Hidden smiles broke out all over the regiment for the next few days and many blue pencils were wasted on letters home. Strangely – it was the last time we saw that meat ! Lambs hearts smothered with a liquid of indeterminate origin on a cold tin plate was quite another thing for breakfast ! When we were in North Africa , and particularly around the Bone ( Annaba) area we noticed one or two mosquitoes which were annoying – to say the least – and to prevent the onset of malaria decimating our ranks, we had already lost a driver Albert Fairclough who had to be sent home as he was a constant victim and little could be done for him. A scheme was devised by the medics and those charged with our good health, to minimise this situation by treating the open expanses of water with a mixture of what we called “Paris green” ( Arsenic) and sand – which was in fair supply. The mixture was set out at one shovel paris green – 99 shovels of sand – mixed well and spread over the water. This seemed to contain the insects as whenever the larvae of the Annepholes mosquito came up for air in its twin tubes – the mixture was also sucked in with the air and it was good bye charlotte. This treatment was the source of much discussion - there was really little to talk about anyway, and it was mentioned in a few letters back to the U.K. The regulars in a local pub somewhere in Leeds I believe it was, and so they decided to help us out with our problem. This had to be an idea hatched late on a Saturday evening just before closing time when the regulars were feeling no pain. In due course this idea found it’s way to our encampment at Bone and was in the form of a large box obviously made at the shipping department of a local Leeds firm, and was the source of much comment by all ranks, with a myriad offers of advice in opening this box. Eventually this box was opened to reveal a series of smaller boxes until the idea was found at the bottom of this pile of boxes, it was a block of wood some 1” wide x 3” long x ½” deep, and a very small mallet approx 2” long. The instruction leaflet was beautifully typed and suggested that the owner of this idea was 1) – catch the mosquito – 2) - lay him/her on the block – 3) - beat his brains in with the mallet. Did anyone else get a really useful gift whilest overseas ? 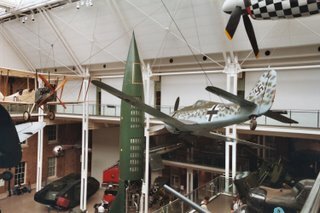 A well-known view of the main Entrance Hall at the Imperial War Museum, London. Among the weapons and modes of transport seen in this photograph is a German V2 ‘Flying Rocket’, one of Hitler’s ‘Vengeance weapons’. A German Fokker Wolf aircraft from WW2 can also be seen. 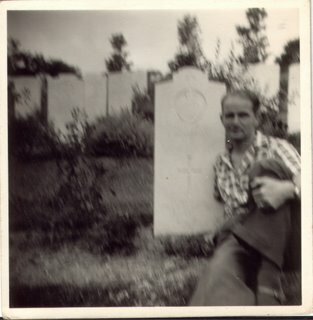 A blurred photograph of Private Hugh McGuinness, Border Regiment taken some years after the war. 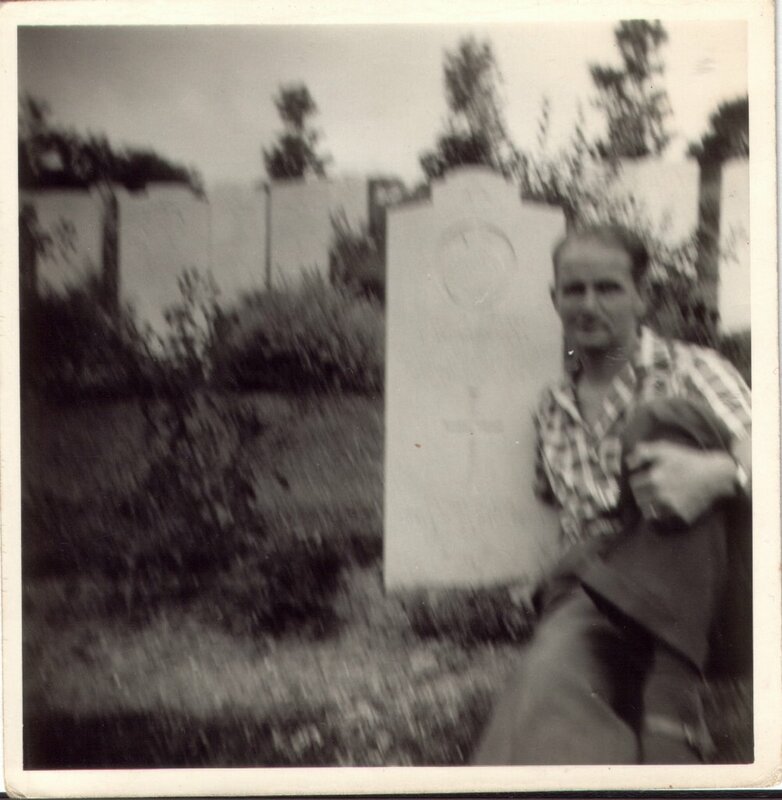 Hugh is sitting in front of a CWGC headstone in Ancona Cemetery, Italy, It is the grave of his uncle and great friend Sergeant Pat McGuinness, 7th Queens Own Hussars, Royal Armoured Corps who was killed in action at Ancona in 1944. 1. North Quay, Maryport, Cumbria. 2. Edward Benn ('Ned') Smith, V.C., D.C.M. Ned Smith became one of the highest decorated soldiers during WW1, gaining firstly the Distinguished Conduct Medal. Both were awarded in 1918. 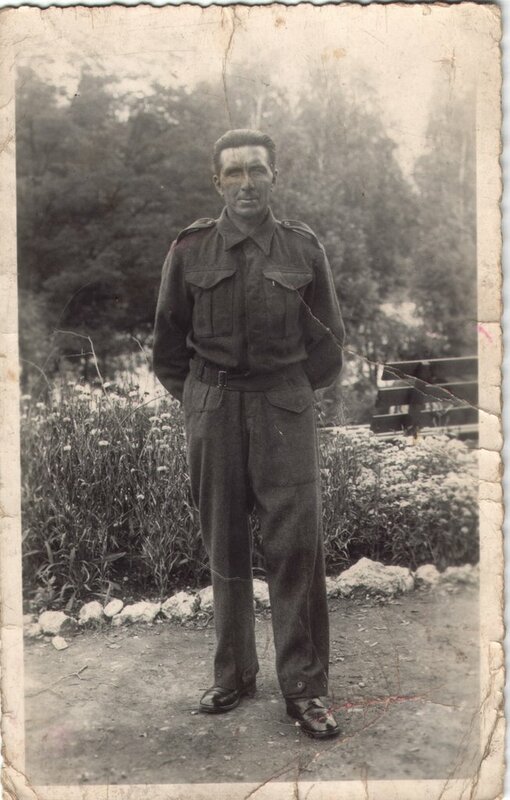 In WW2 Ned Smith was among the first contingent of the British Expeditionary Force to sail for France, and was one of that war’s earliest casualties. He died on 12 January 1940 at the age of 41 and is buried at Bueuvry Communal Cemetery Extension, France. In 1940 very little specific information was published, in the local newspapers at least, about the action in which Ned Smith lost his life even though he was widely known because of being decorated in the Great War. Perhaps this article will mean others will learn of Ned Smith in the two World Wars. 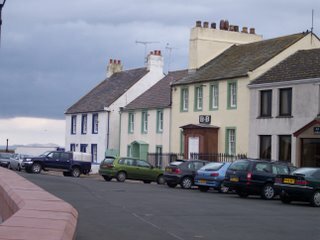 Although there is no Memorial Plaque at North Quay, Maryport for Ned Smith, this is where he used to live with his parents [Photograph No. 1]. The photograph was taken in 2006. 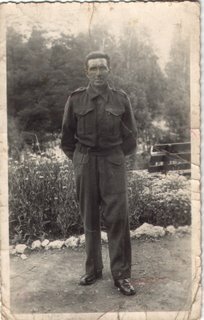 I do have a photograph of Ned Smith in his army uniform and wearing his medals, which was obtained from a newspaper print found in the local West Cumbria Records Office. Photograph No. 2 (above) is a WW1 photograph of Ned Smith and a Victoria Cross. It was printed by the Cumbria Libraries and Archives Centres (2014) and is used here with permission. [For addtional details about Ned Smith in WW1 click on 'Comments' below]. This is a photograph taken inside Bayeux Cathedral, Calvados, France. 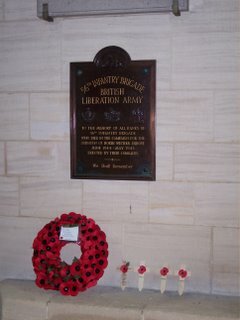 The Memorial Plaque commemorates the Fallen of the 56th Infantry Brigade, British Liberation Army who lost their lives in North West Europe between June 1944 and May 1945. This photograph is of two American Veterans of WW2 who landed in France on ‘Omaha Beach’ Normandy in June 1944, a few days after ’D-Day’ when they were both 19 years old. 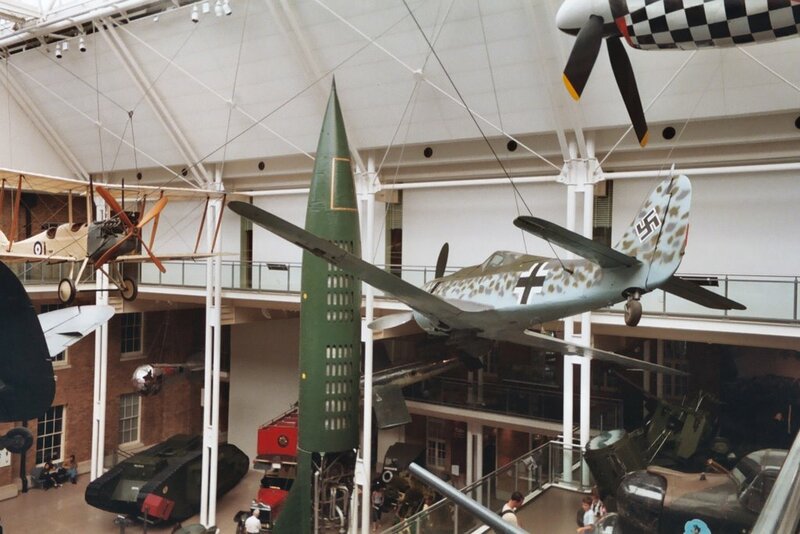 It was taken inside the central exhibition area of the Memorial Museum for Peace in July 1944. They had returned to Normandy for the 60th Anniversary commemorations of the Normandy Landings. 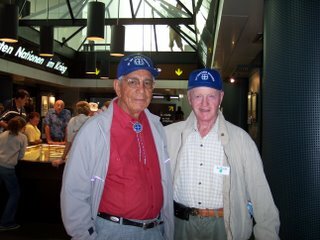 On the left is Mr Abel Nazarette from El Paso, Texas and on the right is Mr Patrick Brennan from New York City (American 60th Combat Engineers, attached to the American 35th Infantry Division). The motif on the baseball caps they are wearing, and the patch worn by Abel, is that of the 35th Infantry Division. This motif, a blue circle with a vertical white cross was based on markers used along the legendary ‘Santa Fé Trail’. Sarah Sheraton asked me if I knew her Father and it brought back a memory of him she would know nothing off. It was boys own stuff and became a local legend among us lads for years after. Do you remember the Catch? and we would all be talking about the wonderful catch Ken made one warm summer evening on Norton Green. I am adding the full story as a comment to this introduction. Those days are long gone in the new age of ipods game boys and computers. All our life was outside the house now the young people never seem to leave the house, they are missing so much and will never know what it was like to make a catch in front of most of Norton on a balmy summers night. Previously un-published picture of Tom Canning ! This was my 21st Birthday in - as you can guess - Rome, just after having lunch at the Piazza Pantheon and seeing the funeral cortege of Maestro Pietro Mascagni - my Mother's favourite opera composer. My friend is "wee wully Fenn" from Glasgow who was a butcher by trade and how he managed to see over his butcher block was a mystery he was so small. It was he who learned the salutary lesson that one did not place a Cadbury's milk bar in the shirt pocket of a KD uniform while watching " The Mutiny of the Bounty" for the seventh time at Bone Cinema in North Africa ! I have just had a look at the new Veterans gaency posting - but surely there is something amiss with this important posting ? There is not ONE photo of Ron Goldstein - who goofed ? Douglas Smithson's story gets my vote.